Slug Testing has never been more reliable, or so easy. 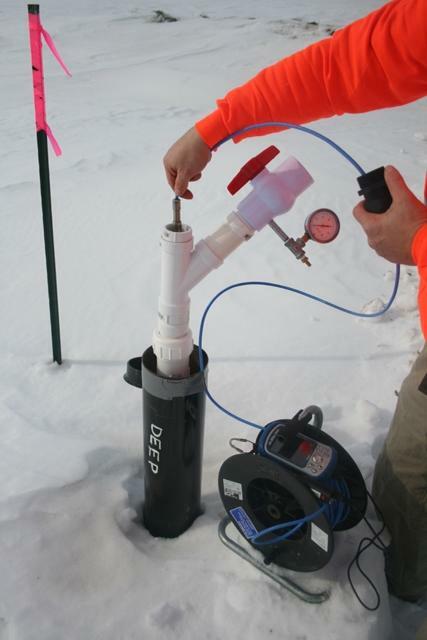 The Pneumatic Hi-K® Slug by Midwest GeoSciences Group is the answer for conducting slug tests in fast recovery wells. It uses air pressure from a hand-held pump to lower the water level and the easy-to-use valve releases the pressure immediately to dramatically improve test results! Each pneumatic slug assembly comes with a pressure gauge reading head displacement in inches or centimeters of water so you do not need to calculate a conversion from PSI! 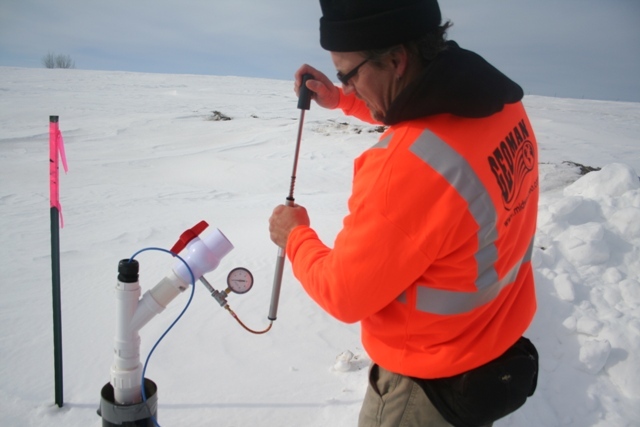 It includes a hand pump for pressurization, a standard attachment for a 2" diameter well, instruction sheet and a storage case. It is compatible with In-Situ and Solinist transducers up to 1" diameter. Transducer cables are accommodated with a compression fitting accommodating different cable diameters. Optional accessories include attachments for fitting 3/4" diameter wells such as those for direct push well installations and attachments for 4" diameter wells. The Pneumatic Hi-K® Slug provides high-quality data for accurate slug testing of hydraulic conductivity (K). The Pneumatic Hi-K® Slug is a kit that is contained in a toolbox and and easily carried from well to well. Pneumatic slug testing methods require an air tight seal at the well head and air pressure to lower the water level. As air is pressurized in the well, the upward water pressure and the downward air pressure are equal. Once the water level has been lowered to the desired Initial Displacement (H(o)) distance and it is stable, the test is performed by releasing the valve allowing instantaneous release of the air pressure. The water level rises (rising head test) and the pressure transducer and data logger records the changes in water level and time. The release of the air pressure exhibits a smooth recovery of the water level with minimal (if any) noise. So tests that recover in a few seconds may be tested with small and manageable Initial Displacements (H(o)) coupled with obtaining reliable data sufficient for a confident analysis. 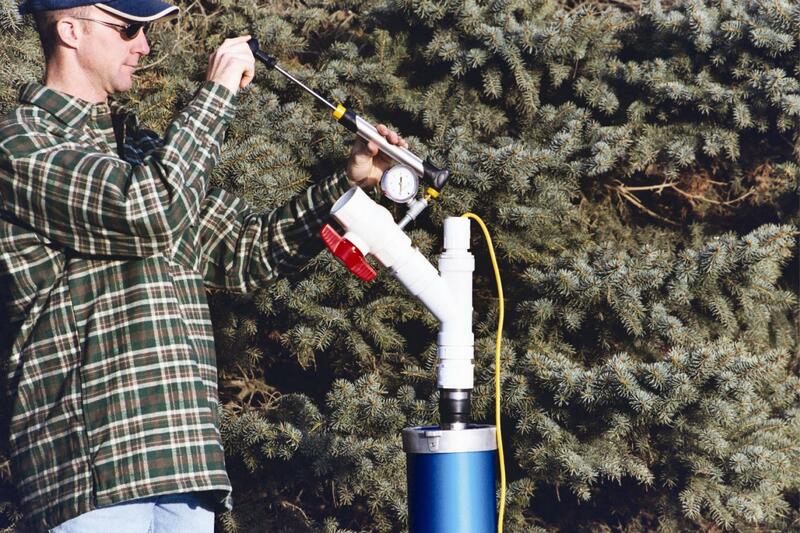 The Pneumatic Hi-K Slug is very easy to use, with easy to follow instructions and a complete equipment check list. My slug tests were quick to perform and I was able to perform 3 tests in the time in would take to do one conventional test. The resulting data was very smooth, distinguishable (no oscillation or pressure wave) and easy to process. 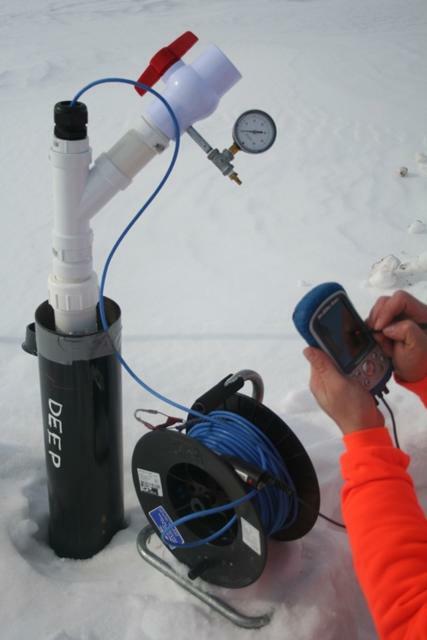 Every Hydrogeologist should have this piece of equipment in their groundwater toolbox. We recently used your pneumatic Hi-K Slug test kit on a project with numerous wells. The kit was easy to use, saved us time, and eliminated cleaning that is required using a traditional solid slug. The best part is that the Hi-K kit provided excellent results with smooth test data that was free of early oscillations typical of solid slug tests. I definitely recommend this kit for others. And you can't beat the price. Thanks again for making our job easier. My company purchased the Midwest GeoSciences Pneumatic "Hi-K" Slug Test Assembly to use on a series of fractured, deep bedrock wells. 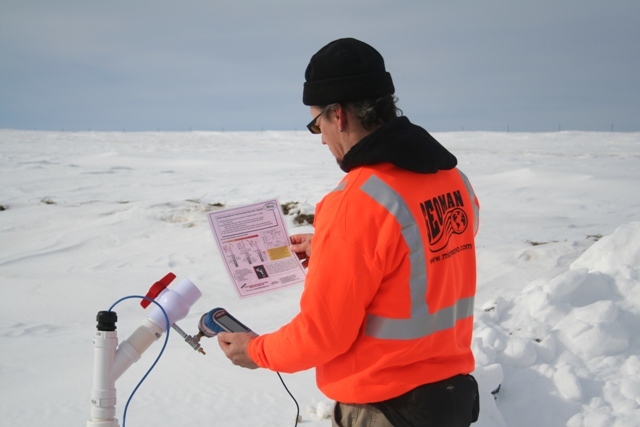 The slug provided clean data during slug tests and allowed us to see oscillatory responses in some wells that were not observed using traditional slugs. For my office, it has become the primary method of slug testing when applicable. The apparatus is well-built, fairly easy to install, and definitely a worthwhile addition one's field equipment inventory. The Midwest Geo High-K Pneumatic Slug Test Kit was very convenient and easy to use. There was no need to transport water and since there is no solid slug, transducer movement during the test is virtually eliminated. I will definitely continue to use this kit whenever site conditions allow. - Aaron Ezzell, PE, PG, Terracon Consultants, Inc. When you order a PNEUMATIC HI-K SLUG®, you can choose pressure gauge options that read in either English units (Inches of Water) or Metric units (Centimeters of Water). Design and measure your initial displacements that work best for you! Simplify test procedures while increasing the reliability and accuracy of designing, conducting and analyzing slug tests! The Solid H(o) Slug& by Midwest GeoSciences Group is a traditional solid slug for slug testing. It is designed to yield a pre-estimated initial displacement in two-inch diameter wells for improving confidence and accuracy of slug testing.